Ideally, every video that I upload to YouTube has closed captions and a transcript. Unfortunately, things are not always ideal in my world. When I have time, I have been using Screencast-O-Matic to add captions to the videos that I make for my students. Here’s an example video that I made to show students how a new blog commenting system works. Click the closed caption icon that is shaped like a box with lines of text in it, in the lower right band where the controls are, to see the captions on this video. The icon is shown in the image below, all the way to the left. To make the captions on this video, I used the speech-to-text capability built into Screencast-O-Matic Pro. Unfortunately, you do have to upgrade to use the speech-to-text tool, but the cost is an economical $18 annually. The tool created a rough draft of the captions, but I had to go through and edit them by adding words and phrases that it missed and correcting things that it misheard. The whole process took a little over an hour, which may not seem bad until you consider the length of the video. The video is only 3½ minutes long, so I spent about twenty times the length of the video to make the transcript. Now extend that time commitment to a 10 minute video, and you need to plan at least three hours. That’s quite an undertaking for something that will only result in 10 minutes of curriculum material. Fortunately, YouTube includes a setting that allows a video creator to crowdsource the captioning for the videos that she uploads. From my perspective, it’s the most important setting on YouTube. Just follow the instructions to Turn on & manage community contributions and anyone can add captions to your video. The system allows you to review, change, or reject the captions. I already have an assignment that invites students to crowdsource transcripts. This YouTube setting facilitates their contributions to the course smoothly, and as a bonus, it reduces the work I have to do since the captions are added directly to the videos. In addition, students can contribute by adding to existing captions if they notice a correction is needed. I still plan to create captions for all my videos, but it’s nice to know that these alternatives exists. Do you have suggestions for improving the process of providing transcripts and captioning for video and audio content? I would love additional ideas and assignments. Please tell me about your ideas by leaving a comment below. When students compose assignments, I expect them to pay attention to accessibility in addition to the usual issues of content and format. After all, even the most brilliant document will be unsuccessful if readers cannot access it. When students are turning in PDF files, the basic process is to create the document in a word processor and then use that word processor file to generate a PDF. To guide this process, students can use any one of dozens of checklists and resources for help. In particular, the Checklist for Making Accessible Microsoft Office and PDF Documents from Johns Hopkins is thorough and includes links to additional information. Use built-in tools for document styles. Word processors have built-in style templates for a document’s title, headings, and lists. Screen readers – software applications that assist sight-impaired users access what is on the computer by means that are not sight-dependent – look for these templates as a key to the organization of a document. If the document has created its own style markers (say, using a bold, 12-point font for primary headings), the screen reader won’t recognize that information as headings. Beyond making documents accessible for screen readers, the built-in tools create a professional design without any extra formatting work. Choose meaningful names for hyperlinks. Screen readers read all of the links in a document in a kind of menu. These links are read without the surrounding text that provides their context. To ensure that your readers find the right hyperlink, use the name of the document that a hyperlink connects to, rather than vague text like “Click Here.” Because of the way that screen readers read the links, “Click Here” doesn’t make sense since the context is missing. Basically, readers have no idea where “Click Here” will take them. Use Save As PDF… and never Print to PDF. If a PDF does not include text (words and other characters), screen readers don’t know how to interpret the information. That’s the problem with the Print to PDF command: it saves an image of the document rather than the text. The resulting PDF may look the same to someone with sight, but the screen reader can’t use it. Additionally, any special features like embedded hyperlinks will be gone in a document created with the Print to PDF command. Instead, always use the Save As PDF command, which maintains text recognition and features like embedded hyperlink. For extensive information on how to save your documents, I recommend PDF Accessibility: Converting Documents to PDF from WebAIM. Microsoft also has instructions on how to Create Accessible PDFs. There is much more that can be done to make a document fully accessible, but this bare minimum goes a long way toward ensuring that someone gets at least the basics of what the document is trying to communicate. For other ways that I address access, you can read details on how I tell students about accessibility in my courses as well as how I ask students to crowdsource accessibility documents for the course. Do you have any activities or instructions that you use to talk about accessibility with students? Tell me about them in the comments below. I’m always eager to find new resources I can use in class. 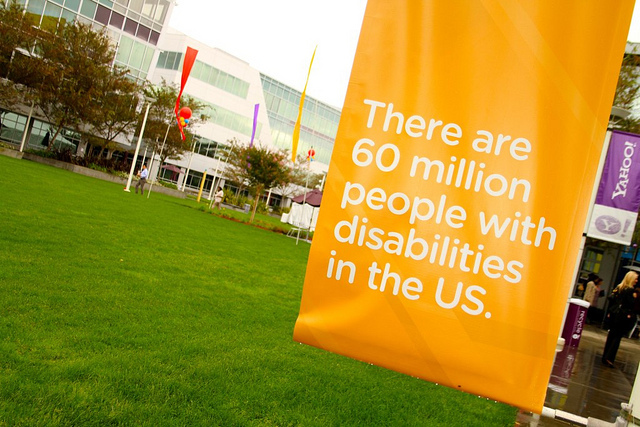 Photo credit: There are 60 million people with disabilities in the US banner by Yahoo! Accessibility Lab on Flickr, used under a CC-BY-SA license.